This is a tutorial on installing the free sIBL HDR application. It focuses on integration with 3D Studio Max and Vray. Similar steps may apply to other 3D programs. If you don’t know what sIBL is used for, I’ve written a small article under the Questions Section of this website. sIBL is divided into several main parts due to compatibility with many different 3D applications. While confusing at first glance, there’s only a few pieces you will need to install. You only need the sIBLedit if you plan on creating your own sIBL sets or editing sIBL files. This is the HDR/sIBL Browser which sends your files to your choice of 3D application. The latest version of sIBL can be downloaded here: sIBL downloads. 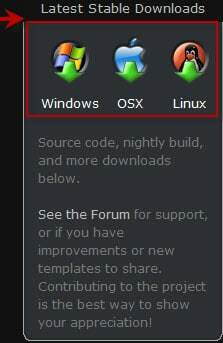 Downloading sIBL GUI for your OS. You’ll need to instruct sIBL the 3d program you will send your sIBL HDR images to. 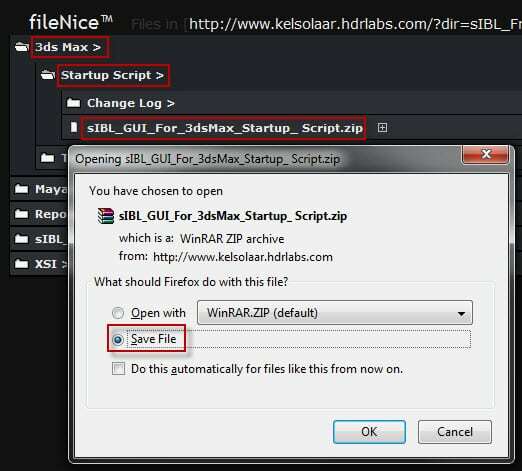 sIBL GUI Startup Script for 3D Studio Max Installation. Extract the file you just downloaded. In this example, the extracted file is called: sIBL_OLE_ExecutionCommand.ms. Move this file to your 3d Studio Max Startup Scripts directory. In this example it would be: //Program Files/Autodesk/3ds Max YOUR VERSION/Scripts/Startup/. sIBL_GUI should now be able to communicate with 3DS Max. There are additional files under the “templates” section of the HDRLabs fileNice repository. The repository contains both archives and newer versions of the templates (ie. Vray, Mental Ray, Scanline, etc.) These separate files allow sIBL_GUI to tell the rendering application how to interpret sIBL. Occasionally, this section will post a newer beta version of a template that may contain some application-specific bug fixes or new features. Also note that sIBL_GUI will automatically check for newer templates as well. If you’re using a pre-2010 version of Max, you may need to use the previous sIBL loader that Dschaga over at HDRLabs wrote. This does not use the sIBL_GUI mentioned above. Instead it uses the sIBL 1.0 system and browser. You can download the older sILB version here under the loader section. You’ll need to extract the sIBL_loader_95.ms to your 3DS Max Scripts directory. One way to launch sIBL_loader_95.ms is to open up the script in Max, select all of the content, and drag it to an empty 3ds Max toolbar. Give it a useful name such as “sIBL” by right-clicking on icon and save.